Well, if you haven't noticed yet. . . . . I have gray hair. And I'm silly. Sometimes. . . .really, really silly. One of the reasons in my "Top 10 reasons I'm going to love going gray" list that I made when I was first going gray was so that I could wear braids. Turns out I kind of stink at making braids, but the point is. . . . gray hair doesn't have to be serious or boring. And although the process can seem daunting, there is a whole lot of support out there, if you know where to find it! 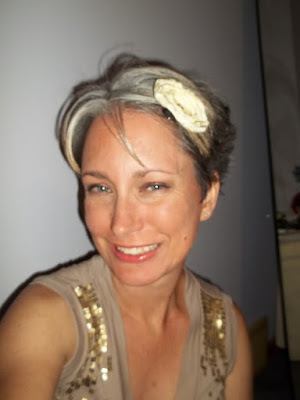 I began my "going gray" journey back in the very beginning of 2012. I can't believe it's been 5 years since I began. My "going gray" journey was a little quicker than some people's, because about 6 months in I got impatient and got a pixie. Even then, I still had some color left on the ends. When I began to go gray, most people were supportive. I figured I picked a good time to do it since people were trying to intentionally color their hair gray. The whole granny hair thing was just getting traction back then. I remember hoping back then that the granny hair thing would last long enough for me to get through the growing out phase. I believe people are still doing it, right? It's an awesome time for people who are naturally gray underneath all of their color to go back to their "authentic" selves. I'm not going to lie. The first several months are hard. You're at that stage when people are looking at you and might be wondering what in the world is going on on your head. I mean, "Are you intentionally letting your roots show like that?" I remember when I was still coloring, how embarrassing it was when it was time to color my hair again and I had that 1/2 inch of gray showing. For me, once I got past THAT point when I was growing out my gray, I was fine. I actually even had a lot of compliments. I looked like a calico cat. . . . . . but, whatever. In the photo above, I was 5 months in. By this point, I'm pretty sure people knew what I was doing. If you have been throwing around the idea of going gray, you don't have to do it alone. There are so many wonderful support groups on Facebook. Some of them are extremely active with people in all stages of being glitterific. There is everyone from people who are possibly considering maybe stopping the coloring to women who have been dye-free for decades. Everyone cheers everyone else on. If you have questions you can ask questions. Or, you can just be there to support everyone else. 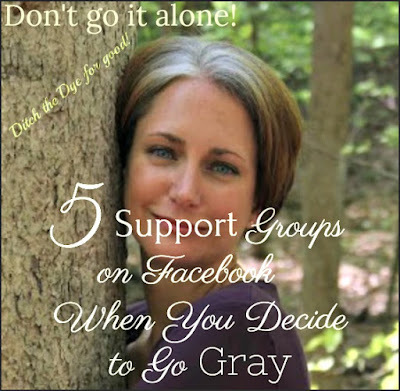 Here's a list of Facebook groups for Gray Hair. You have to be approved to get into most of the groups as they're closed groups. And if you want to read about what I was feeling in the first month after I decided to go gray, please read this "Thank You" post. I truthfully don't even remember writing it. That just goes to show you that the transition process doesn't last forever! 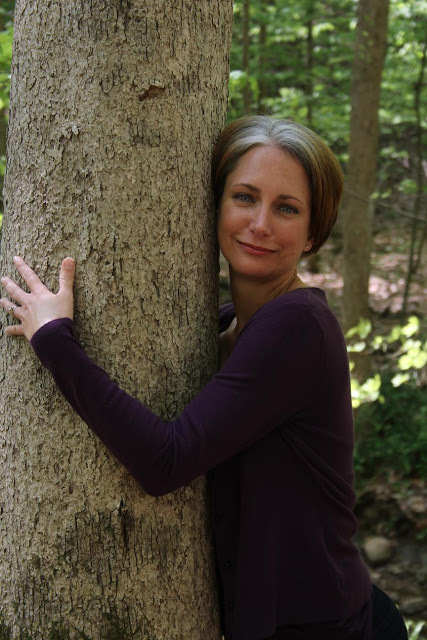 And remember, gray hair doesn't have to be dowdy, matronly or boring! It can be vibrant, youthful and fun. Just join the groups above and you'll see that! Have you considered going naturally gray? I would love to cheer you on! I'm 43 and am going grey. I tried going grey 6 years ago but didn't want to cut my hair short so I quit after a few months and went back to coloring. I knew I'd have to be willing to cut my hair if I was really going to do it. Now I'm finally ready. My best friend doesn't want me to do it and that's hard. But I'm going to have to just tell her I need her support because I really do want to wear my hair naturally. I feel like a fake when I color. Cheer away! I got my hair chopped and highlighted a couple weeks ago so the transition will be easier. I know lots of people go grey with long hair, but I knew I couldn't do that. Go Ginger! Go Ginger! :) Good Luck. Once it's over with you'll feel so free. I'm not a long hair person in general, so it didn't bother me to cut mine. The only reason I have mine long now is because I'm trying to grow it long enough to donate it. My hubby wants me to keep it long, but it drives me crazy! We'll see how it goes. Ha! I think I'm following you on Instagram now, so keep us updated on your progress! Hi Caren! Thank you. :) I think pure white would be gorgeous, but I'm sure your hairdresser could add gray low lights. Definitely check out the groups. Lots of inspiration there. I absolutely LOVE your gray hair! It looks AWESOME! I want to let mine go gray. I call it gray like you do but my stylist insists on referring to gray hair as silver and she also insists it will not look good on me and will make me look older than I am (50s). Thanks for sharing the groups, going to check them out. I saw your post at the Friday Favorites Party 366. I've just recently started on this journey. My first blog post on it will publish tomorrow so the timing of your post and information you've shared is perfect. Thanks. 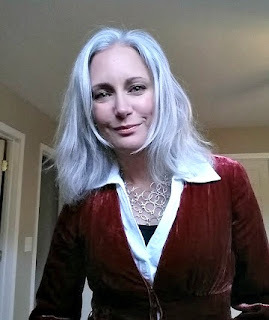 Hi, I'm 41 and in 2015 I stopped coloring my hair. First I got high lights, but it ended up turning really brassy and brittle. I hated it. Finally I decided to just grow it out so I went to another hair dresser and he suggested I cut it chin length (which scared me bcz I hadn't had it short in years) and get low lights. Well, after about a year and a half and lots of patience it finally grew out. There's always two camps: those who LOVE your gray and admire you for being so brave to go gray, and those who absolutely hate it and constantly get on you to color it. My life is a lot easier without having to deal with dyeing my hair, but there are times I miss my brown and I know it did make me look younger. If you'd like to see my pics go to Pinterest and look for me under Texas Tea in my Silver Fox board. Yes, I believe that's true. I mainly have supporters, though, thankfully. Searching is not working. Do you have a link to the Pinterest board? If I didn't work I would be gray well actually white. I am down to adding coloring almost every three and half week weeks to 'avoid the stripe'. Does it impact your job? Were you treated differently? my co-workers say yes. It was that coloring every 4 weeks that finally got to me and the fact that putting the chemicals on my head that often finally freaked me out! I'm a stay at home mom, so I have no reference to impacting my job. I'm sorry to say. But, mainly I've had only positive remarks since going gray. I don't know if it will affect me being able to get a job in the future or not, but it was truly one of the best decisions I've ever made for myself. Silver CAN be beautiful, but theres NO REASON to let it grow out looking like a "calico cat" for YEARS. Talk to your stylist, there are many options to transition seamlessly working towards your goal of eventually not coloring. Color can be removed, combinations of hilights/lowlights and demi permanent glosses can blend and soften. You CAN stay polished and AVOID feeling like the process is a struggle. If your current stylist doesnt support you or have suggestions, find a new one. I've helped many of my salon clients transition and they looked flawless and beautiful every step of the way. Best of luck ladies!